I tried my hand at creating a logo for the blog...tell me what you guys think. I sat down this morning to read the Chicago Tribune over a cup of coffee and find on the front cover a blurb for an article in the Technology section about the iPod...but for once, and this is a rare occurance it would seem, that they were not head over heals in love with the iPod. 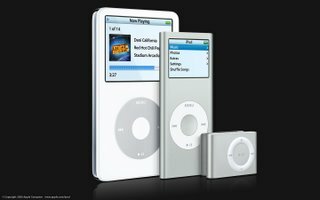 In the article the author discuses how he believes that Apple has over-extended themselves which has taken away from the core experience of music, which is the iPod's main purpose. “Hence, Apple keeps giving us a little less with each iPod, save for increased storage, but keeps adding more content to sell. I think this is a sign of whats to come. As Apple has hit critical mass, the iPod has gone from being the tell-tall sign of a hip trend setter, to being the standard...and in doing so lost its cool. It looks preatty sweat, but as of this time there is very little that we know about the product. We'll keep you posted if any new happenings occur.